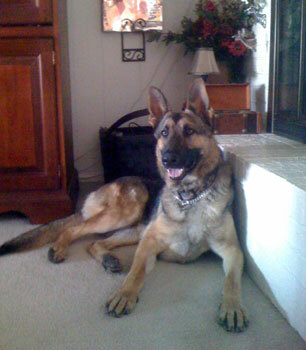 Would you like to read a few German Shepherd Rescue Stories sent in to us by readers? Feel free to read many of them here. As far as the German Shepherd standard is concerned, the coated German Shepherd Dog is considered to be a fault according to both the AKC and the International (FCI) breed standard. Do you need to research a German Shepherd Growth Chart? It can be an interesting read however don't get too caught up in all the numbers - remember, these are only averages - your GSD may be different. Looking for GSD Trivia? Here are lots of fun German Shepherd Trivia and Fun to Know Facts. One Day Sale! Save 15% On 2012 Calendars With Code FLIPDAY15. Plus $1 Shipping on Any Order! The holidays are right around the corner - so, to make it easier for you to shop for German Shepherd related items - we've consolidated many of our shopping related pages in the form of links from one single page. Here you can find handbags, calendars, wallets, collectibles, toys, books, posters and artwork, dog supplies and more.